The Stop-It Smoking program, made by Natra-Bio, uses two natural herbal and homeopathic formulas to help smoker quit without using nicotine. The ingredients in the two formulas work together to address tobacco cravings and to reduce the symptoms of nicotine withdrawal, which include nervousness, stress, irritability, headaches, insomnia, and digestive upsets. The Stop-It Smoking anti-craving lozenges, which reduce cravings for tobacco, are dissolved in the mouth at a frequency of one every 1-2 hours for the first month of the program, one every 2-4 hours for the second month, and one every 4 hours or as needed during the third and final month. It is important not to chew or swallow the lozenges, and the user should not eat or drink for ten minutes prior to using a lozenge. The other formula, the Stop-it Smoking detoxification tablets, helps to clear nicotine and other tobacco toxins from the body. Users are to chew 2 tablets or dissolve them in their mouth 4 times daily for the first month, 2 tablets 3 times per day during the second month, and 1 tablet 3 times daily during the third month. It is important not to drink or eat for 10 minutes prior to or after taking the tablets. The Stop-It Smoking program may be used as a smoking cessation program entirely in the place of cigarettes; for those smokers who are attempting to cut down on smoking but are not ready to stop entirely, the two formulas can also be used to reduce the frequency of cigarette use. The homeopathic ingredients found in the two Stop-It Smoking formulas are nicotine-free and are never tested on animals. The two proprietary formulas are manufactured in compliance with the drug manufacturing guidelines outlined by the FDA. Caladium seguinum, effective in reducing tobacco cravings. Plantago major, which also addresses cravings for tobacco. Cinchona officinalis, helpful in relieving the symptoms of nicotine withdrawal. Lobelia inflata, another ingredient which reduces tobacco cravings. Nux vomica, an effective agent for addressing the effects from nicotine. Staphysagria, helpful in reducing nicotine withdrawal symptoms. Calcarea Phosphorica, which reduces the craving for tobacco. Ignatia amara, helpful in promoting calm and relieving nervous tension. Inactive ingredients: Croscarmellose Sodium, Lactose, Dextrose, Natural Raspberry and Cherry Flavors, Sorbitol, Magnesium Stearate, and Stevia. Avena sativa, a potent detoxification agent that also reduces mucous. Euphorbium officinarum, helpful in reducing nervous tension due to nicotine withdrawal. Ignatia amara, which aids in detoxifying the body. Lobelia inflata, helpful in reducing the craving for tobacco. Passiflora incarnata, which reduces the ill effects of nicotine usage. Inactive Ingredients include Cellulose, Dextrose, Croscarmellose Sodium, Magnesium Stearate, and Lactose. 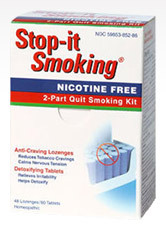 The Stop-It Smoking program is available for purchase at a number of affiliate websites and at retailer sites such as Drugstore.com. The price of the program varies by site; for 48 lozenges and 60 tablets, the cost ranges from $13.04 to $19.99, excluding shipping and handling. The amount of product offered at these prices may only be sufficient for several days, so the total cost of the Stop-It Smoking program over the recommended three-month period could easily climb to several hundred dollars or higher. No money-back guarantee program from Natra-Bio is mentioned, although individual retail sites like Amazon.com and Drugstore.com may offer their own corporate product guarantee program. Research on the success rate of the Stop-It Smoking program is sparse to nonexistent. The few users of Stop-It Smoking who shared their stories had mixed results. A few smokers stated that they were able to stop smoking after using three or more of the two-product kits. Other users who tried the Stop-It Smoking product were unsuccessful in quitting. The homeopathic ingredients in the Stop-It Smoking formulas are helpful in reducing nicotine cravings and relieving some of the symptoms associated with nicotine withdrawal, but the program lacks the psychological support that is required for success in quitting. The cost of the program over a few months also becomes rather expensive, and the manufacturer doesn't currently offer coupons or discounts to offset the cost of the program.